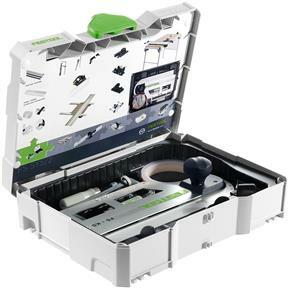 A complete kit to maximize the value of your FS guide rails when used with your Festool plunge saw or router. Quickly set angles for both mitered and compound cuts using the Angle Unit. Make accurate repeat cuts using the Limit Stop. Work more efficiently by attaching the included Deflector to the end of your rail to prevent your suction hose and cords from getting snagged. Connect rails for limitless cutting with the included Connectors. Use the two included Screw Clamps to for more secure, reliable cutting. Also includes replacement Splinterguard for splinterfree cuts.